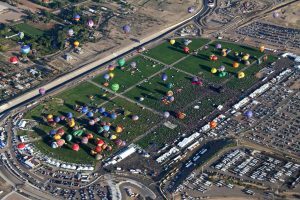 We want to start a new practice here at the Balloon Fiesta Park (BFP). We will be holding yearly, pre-season meetings with the different user groups. TONIGHT, January 23rd, at 5:00pm, there will be a meeting for all balloonist that use BFP. The meeting will be at the Golf & Event Center, 9401 Balloon Museum Dr. (South end of the park). AAAA is encouraging all pilots, crew and anyone that will be on this field, to attend this meeting. There will be lots of good information about the field, how we can to properly use it and what improvements are being made. It would be ideal to keep the meeting to 1 hour, 1 ½ max.